Want a website that is truly stylish and perfectly matches your tastes? Xara Web Designer 11 Premium lets you easily create a website with that special look. See how the features work here and let yourself be inspired by fancy micro animations and effects. NEW MODELS Spring is not far away… ride stylishly into the cycling season on one of our latest models! Discover the new features in Xara Web Designer 11 Premium in this demo website. This is where you'll find our biggest selection of classic bikes - from 1950s style models and vintage racing bikes, fixed gear, touring and town bikes, up to single-speed bikes in all tyre sizes. 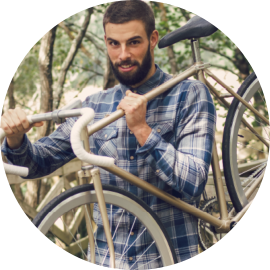 Got a problem with your bicycle, or just want to make sure it's ready for your next tour? Just drop in or give us a call. We'll book you an appointment for as soon as possible. We offer a wide range of bicycle accessories to help you make your bike even more unique. We can cater to your every wish! MARC HIPSTER Marc Hipster has made it his mission to build bicycles that encompass superior functionality as well as outstanding design. He has run a bike workshop in Berlin's trendy Friedrichshain district for 13 years. Marc and his team are available to advise customers from Mondays to Saturdays and will also happily take on individual requests. SHOP This is where you'll find our biggest selection of classic bikes - from 1950s style models and vintage racing bikes, fixed gear, touring and town bikes, up to single-speed bikes in all tyre sizes. WORKSHOP Got a problem with your bicycle, or just want to make sure it's ready for your next tour? Just drop in or give us a call. We'll book you an appointment for as soon as possible.. ACCESSORIES We offer a wide range of bicycle accessories to help you make your bike even more unique. We can cater to your every wish!